Membership websites created using WordPress have the potential to provide you a steady stream of income. For example, craft compelling content and receive payment for it. In addition, use your loyal readers as test subjects for new products or services. And to top it off, do all of this while maintaining higher levels of control access. For today’s purposes I am using the Paid Memberships Pro WordPress plugin. Reason is, it is flexible enough to cater to any type of membership website and is also free. This means it is budget friendly for anyone interested in building a membership site. And hopefully I turn the sometimes complex task of building a WordPress membership website into a simpler process. 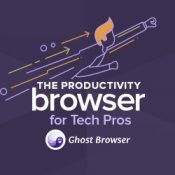 Ghost Browser is the Productivity Browser for technology professionals. It will make any WordPress professional work smarter and faster. Each tab can have it’s own cookie jar so productivity gains are incredible.